Everything is right with this release. 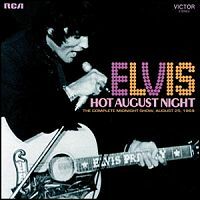 One of the best concert Elvis performed ever. One of the best audio quality ever. Both sonic- and mixing wise! Elvis is in healthy good mood, singing dedicated and energetic. Glimpse of full blown stand-up comedian and proud to be on stage while he introduce Tom Jones (as Thomas! ), Nancy Sinatra and Shelly Fabares and others. Only a way too long humming and jamming on 'Hey Jude' drags down a little, but thats "skippable". I really like the long intro to 'Suspiciuous Minds'...these 1969 versions really have an edge not found anytime later. It only took another season in Vegas to rush it out of the soul/blues segment. A pity, but all the more valuable to have these 1969 recordings in such a great sound. It deserves the 7" package it comes in. HIGHLY RECOMMENDED!